Careston - Angus District, Brechin Landward. 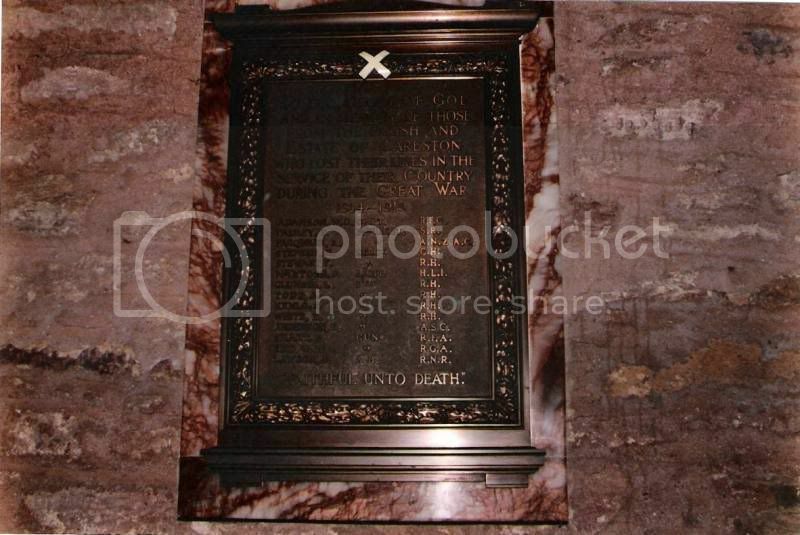 The Careston war memorial is a very fine bronze tablet with marble surround set on the wall of the kirk. 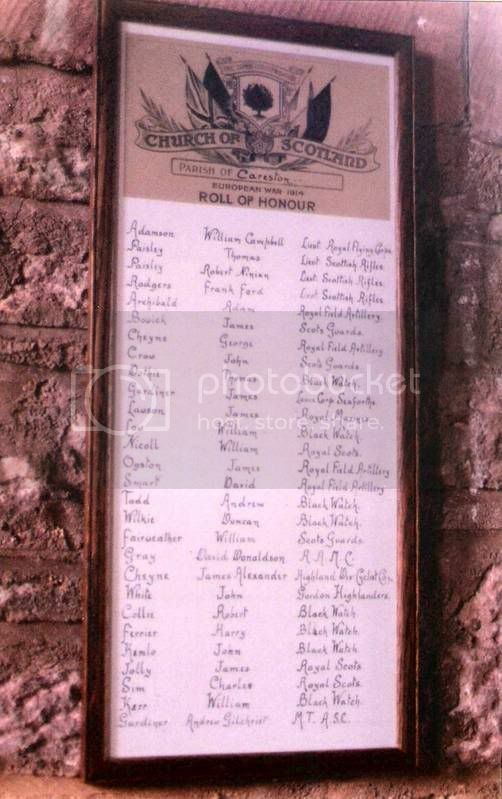 There is also another 'Roll of Honour' on the wall nearby with a longer list of names. I would assume this is a list of all of the men of the parish who served in the Great War, including the survivors. Yesterday afternoon in the Parish Church of Careston a memorial tablet was consecrated to the memory of the officers and men from the parish and estate of Careston who gave their lives in the service of their country during the war.Though the parish is a small one,14 names-including those of the young laird and the minister`s son-appeared on the tablet,which is of bronze,mounted on a raised marble slab. The service was conducted by Rev R Paisley,minister of the parish,and the Rev A Munro,Menmuir UF Church,the latter delivering a short address. Son of William Shaw Adamson and Nora Jane Adamson:husband of Margaret Stancomb Adamson,Whyte House,Weeke,Winchester.Born at Careston Castle,Forfarshire. Son of the Rev Robert Paisley and Mrs Paisley,Westerlea,Brechin,Forfarshire:husband of Margaret Amelia Brownlee Paisley,5 Winton Drive,Glasgow. Tom Paisley is on both the Brechin War Memorial and the Roll of Honour but William Campbell Adamson is on neither. Son of James Kemlo, of 2, Wellington Park, Montrose.